Robots and lasers aren’t just for the boys, but you don’t have to tell us that. At Shipley, we make it our mission to instill a love of learning in all students, across all disciplines, regardless of gender. As educators, we play an important role in encouraging students to step outside of their comfort zones and challenge the gender roles that society chooses for them. One important way we achieve this is through our integrated STEAM (science, technology, engineering, art, and mathematics) curriculum in the Upper School. While not a requirement for graduation, we do encourage interested students to pursue electives like Engineering and join science- and math-oriented clubs, like Science Olympiad. This often has a domino effect. Girls enrolled in Engineering frequently encourage their female classmates to take the course too, even if they don’t feel they fit the traditional “mold” of an engineer. “Keeping every door open for our female students is important as they move through these pivotal years,” says Chris Fornaro, STEAM Department Chair. Once enrolled, collaboration and teamwork are not only expected, but required. Students in these STEAM courses are treated as professionals, learning to utilize the iterative design process while approaching a real-world problem in class. To put the skills learned in the classroom into practice, students use our MakerSpace, which is a modern take on what parents will remember as “shop class.” The MakerSpace is divided into two halves. The first looks like a typical classroom where students can work together and the second is a collaborative workspace with woodworking materials, a laser engraver, a CNC Router, and other tools. Fornaro says the space promotes a learning environment that acknowledges that failure is common – even welcomed – and that students can learn and grow from the challenges they overcome there. 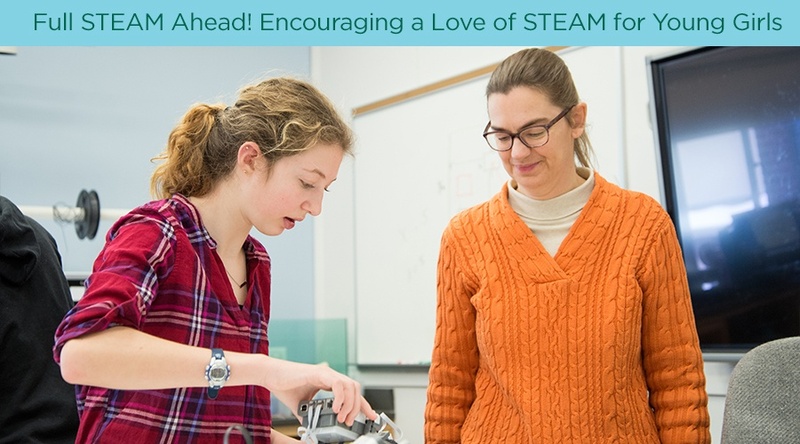 To encourage diverse participation year after year, we commit to keeping our Upper School STEAM department staffed with women as well as men and we ask our female faculty members to coach extracurricular activities like Science Olympiad. Keeping our female staff front and center as role models in STEAM not only encourages their female students to sign up each year but also helps these students see themselves working in STEAM in the future. The ultimate goal of the STEAM department is to arm all students with the skills and confidence to be successful in whichever career path they may choose. By encouraging young women to embrace the STEAM curriculum and most importantly learn these important real-world skills, we have the ability to set them up for success in an increasingly diverse workforce. Learn more about our Upper School Curriculum and how we create independent and resilient thinkers and problem solvers.